The original Dungeons & Dragons books urged players to make the game their own, to devise their own characters, settings, and even rules. 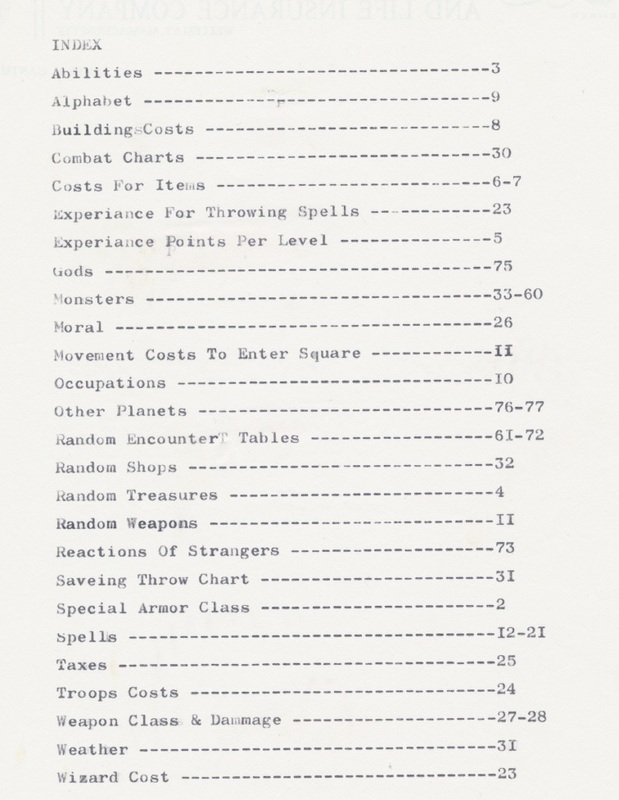 D&D was, as Games magazine mused in 1979, less of a game than a design-a-game kit. 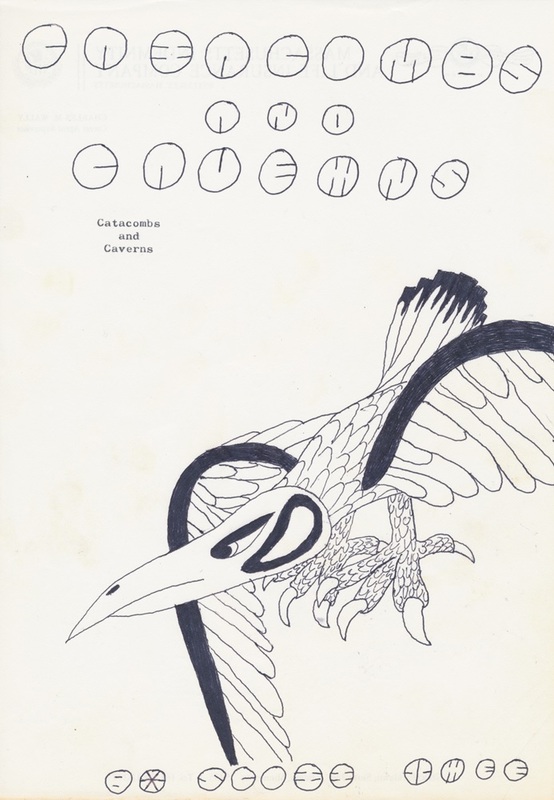 Some early adopters invented enough alternative and supplemental material that they declared their campaigns to be independent games--some of which became commercial products, but many more only managed to circulate as self-published curiosities. Catacombs and Caverns (1976) is one of the latter. In the runic script of the world of Tharin, the cover credits the game to "Scott Free", a pen name for Scott Aldridge of Minneapolis. Like the Rules to the Game of Dungeon, Catacombs gives us a window into how Twin Cities early adopters engaged with role-playing games. We are to understand the symbol of Evitagen is a sword, not a cross. Corresponding directly to this trinity, three NPCs dominate Tharin's story: the lawful leader Voroc; the evil "Soixante Quinze"; and the neutral Manny O'Mally, the last apparently a surrogate for the designer. The Catacombs system depends mostly on percentile rolls, starting with values for the core attributes (here Strength, Intelligence, Constitution, Dexterity, Charisma, Comeliness, and Agility). Combat works based on subtracting armor class from the weapon class, and then rolling percentiles: if the subtraction yielded a 0, you require a 100 to hit, if 1 then 90, if 2 then 80, and so on, where 100 always hits and 01 always misses. 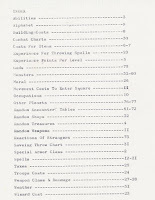 There are exactly one hundred spells, many familiar from D&D, to be allocated randomly to wizards, though a roll of "00" allows the wizard to "create new spell"--curiously, "this spell can only be cast on July 27th Earth time" at high noon, with the approval of the wizard's guild, and it will replace an existing spell on the list. Experience awards are based on a level difference between the character and the slain monster: killing a monster the same level as you gives 25 experience; for 10 levels higher than you, 25,600 experience; and for 18 levels higher than you, 6,553,600, an amount sufficient to raise a starting character to 19th level. 21st level characters are "taken in by the gods" and removed from play. Catacombs and Caverns sets itself apart from other rip-offs of the OD&D period with its detailed articulation in a rulebook more than 75 pages long, which can give us fresh insight into how people played in this free-wheeling period. Scott Aldridge seems to have bought a copy of D&D from Dave Arneson personally in the Twin Cities early in 1976; he also expresses familiarity with Empire of the Petal Throne, Tunnels & Trolls and Monsters! Monsters! But the draft probably seemed too juvenile and unpolished to interest the publishers he contacted, who included the Twin Cities imprint World at War. We are thus left with just this amateur edition, a testament to how enthusiastically people accepted TSR's offer to take charge of the rules. Interesting and amusing. The combat system is intriguing,although it sounds as if attacker's level is ignored. Screaming yellow zonkers should be a monster. That's some really clever visual design. Really reminiscent of some stuff of the more modern era. 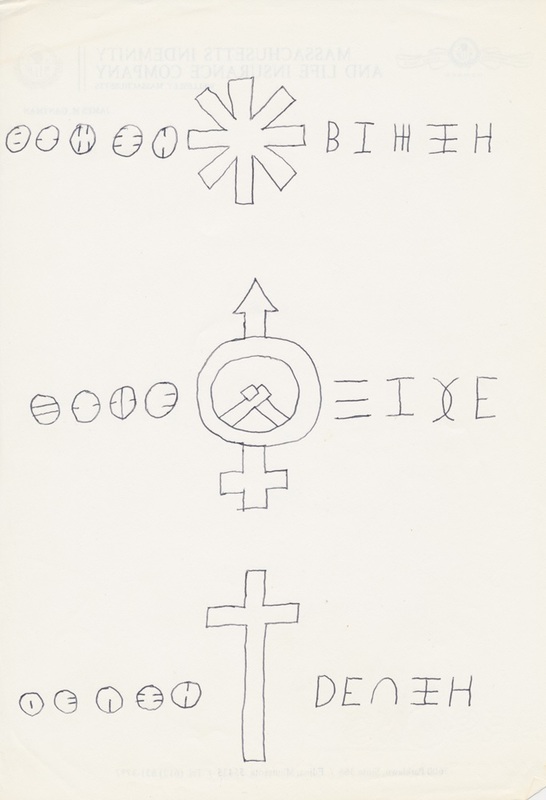 Assigning shapes and symbols powerful meaning wasn't really the vogue of fantasy in the 70s so he must have been pulling from some deep roots for this one. I kinda like the Flying Gold Piece. Intriguing that the symbol for death represents a sword, which is exactly what happened with RuneQuest's death rune a few years later. Amazing article. I thought to be aware of every obscure fantasy rpg but i have been proven wrong. Thanks for all your precious work in uncovering these lost gems and pieces of history which would otherwise be lost. I wonder if EGG in Eggman has anything to do with E Gary Gygax? They are the eggmen. I am the walrus. Goo goo g'joob. Or Blackmoor's Egg of Coot , maybe ? What about the chapter titled "Experiance for throwing spells"? Does the XP's obtained depend on the level of the spell cast by the wizard? Or is there some other convoluted mathematics to do? It is actually based on the level of the wizard: lower-level wizards gain more experience on a per-spell basis for casting than higher level wizards. Systems where casting grants experience seem to have been a thing in the Twin Cities early on.